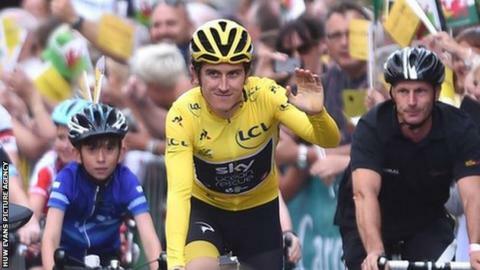 Tour de France champion Geraint Thomas has signed a new three-year contract with Team Sky. The 32-year-old Welshman, whose deal was due to expire at the end of 2018, had offers from other teams. But the double Olympic gold medallist has signed a contract on improved terms with Sky despite saying in 2017 he would listen to offers from other teams. "I'm pleased it's sorted and delighted to be staying," said Thomas. "It's been a great journey for me with Team Sky and obviously the last few months have been crazy. "It's working really well for me here and I'm excited about what's still to come." The new Polish-sponsored CCC WorldTour team made Thomas an offer, with sports director Piotr Wadecki saying he wanted to build his Tour de France team around him. Although Thomas' position as team leader is not certain, Team Sky principal Sir Dave Brailsford had been "pretty positive" his fellow Welshman would stay. "What Geraint has achieved with this team is nothing short of remarkable. It's a brilliant story," Brailsford said. "He's been with us since the start of our journey and he's continued to develop and improve year-after-year. "He's worked tirelessly for such a long time to improve." The Cardiff-born rider has said he would not have any problems about working alongside four-time Tour de France winner Chris Froome, who he expects to be desperate to regain his crown next year having come third behind the Welshman in this year's edition.